Heat a large saucepan over medium heat. Add the oil, onion, garlic, chorizo and chilli flakes and cook for 8–10 minutes or until the onion is tender and the chorizo is golden. Add the lentils, tomato, stock, salt and pepper, bring to the boil and cook for 15 minutes or until the lentils are tender. Serve with crusty bread. Spicy and delicious. This looks like a heart-warming meal. 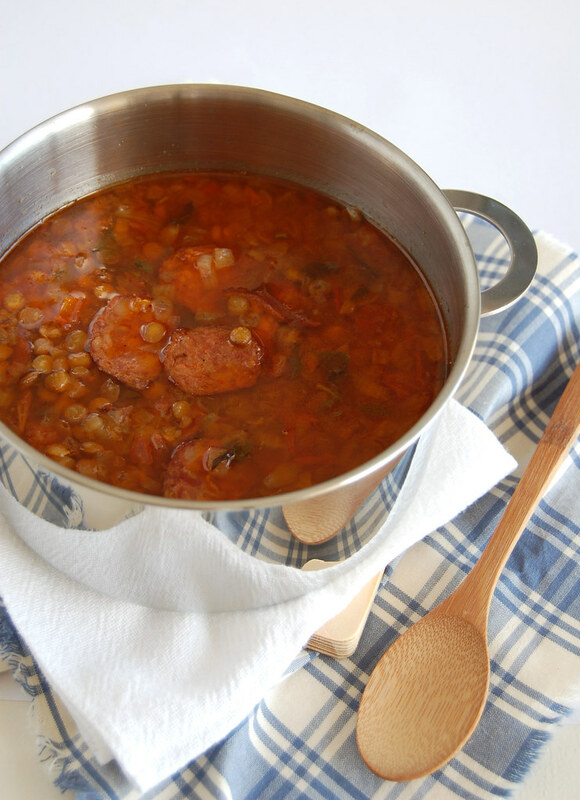 I love lentils in any stew or soup! Exactly same experience... forced to eat red meat whan I was a child, I avoided it as soon as I could. And few years later I found myself craving for a good succulent steak! Now I enjoy it once in a while: I thought could be iron necessity. But I'm not sure. Who knows! Looks delicious and hearty! Love all the spices! This is perfect for the cold weather that we are experiencing right now! Your photo is wonderful, as always. Mother Rimmy, thank you for stopping by! I love lentils, too! Lisa, thank you! Very comforting! Erica Lea, thank you, sweetie! You are just too kind. I am a soup nut and this looks delicious. Thank you for sharing i am going to save this recipe. Also great blog. You have new follower!